I've got lipstick on today! I rarely wear it because I find it so difficult to find a formula that suits me. The cheaper ones which are not special 'kiss proof', 'smudge proof' and generally life proof end up everywhere!! On my teeth, on my lovely gingerbread man mug, sometimes it'll get on to my cheek (I have no idea how). Quite tiresome. But then the more expensive formulas which are designed to stay put all day dry my lips out and then I get a very unattractive cracked and flaky look. I do moisturise my lips daily and yet this still happens. How on earth did women cope with having to wear lipstick every day when it's so tricky to maintain?! I salute those ladies. I am also wearing my very favourite dotty dress (from Hobb's, natch!) 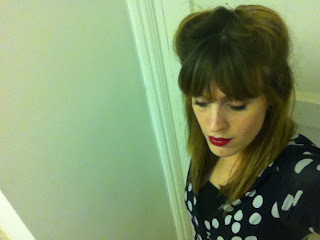 and I have attempted a modern and somewhat 'deconstructed' version of Victory Rolls in my hair. 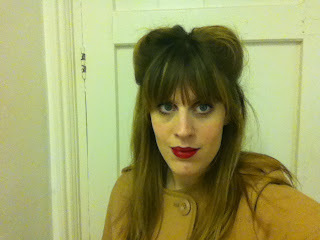 The last picture is of me in my favourite coat - it looks yellow in the photo but is in fact Camel. I always feel so smart and polished when I wear it. 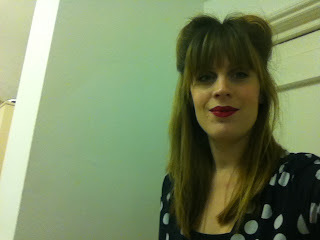 Everyone in the office was quite taken aback today by my 'glam-retro' look, they aren't used to seeing me with lipstick on! I am very glad it's Friday tomorrow. Roll on the weekend I say!! Thank you!! The hair was surprisingly easy and quick to do.